Swallowing balloons could be the solution for serial yo-yo dieters who are reluctant to undergo more extreme weight-loss surgery. A new treatment takes the form of two salt-water-filled spherical ‘bubbles’ that sit in the stomach, giving the sensation of fullness, even when nothing is eaten. The procedure involves no incisions or stitches, leaves no scars and is completely reversible. Gastric balloons, as they are known, have been used for more than a decade in Europe. But many more determined over-eaters say they still feel hunger pangs, despite undergoing the procedure, which costs upward of £3,000. There is also the concern that after the implant is removed, the modest weight loss is regained. The latest device is said to fit the curved shape of the stomach and the manufacturers believe it has the potential for greater weight loss, as the double balloon occupies 60 per cent more space in the stomach than the traditional types. By the time it is removed after six months – the period the manufacturer guarantees that the balloon, which is made of medical-grade silicon, will remain safely intact – the average user has lost two stone. Studies have indicated that intra-gastric balloons can lead to clinically meaningful weight loss of up to 40 per cent of excess weight after six months. A US trial on 30 patients using the new ReShape Duo balloon concluded that the weight loss in those who had the balloon was greater than those who had diet and exercise counselling alone. Another benefit was greatly improved gastrointestinal tolerance compared with those who used a single balloon device. Costing £5,500, the procedure takes just half an hour, during which the patient is sedated – but not with a general anaesthetic – so they stay reasonably aware of their surroundings but don’t feel pain. A fine flexible tube with an attached camera called an endoscope is inserted into the patient’s stomach via the mouth and is used to guide another tube called a catheter and the uninflated dual balloon into place. The two parts are then each filled with 450ml of saline, using a separate tube. This is about 300ml more than is used to fill an old-style single gastric balloon. After six months the device is deflated and removed using a similar procedure. Patients can go home the same day and the balloon doesn’t change the size or shape of the stomach – it simply ensures the patient feels full. Costing £5,500, the the new ReShape Duo balloon procedure takes just half an hour. ‘This treatment is most suitable for those with a body mass index [BMI] of 27 to 35,’ explains Dr Theodore Ngatchu, who carries out the procedure at his clinic, 9 Harley Street in London. ‘It must never be used in people with a BMI of less than 27, but it can be useful in certain cases where a patient has a BMI of over 35 and needs a head start with weight loss for medical reasons. Side effects include nausea, vomiting and abdominal cramps for a few days as the stomach reacts to having an alien object inside it. 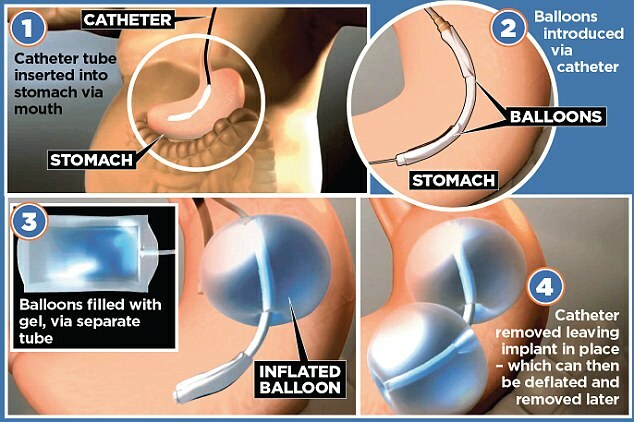 While this would result in early removal of a standard singular balloon, the sympathetic shape of the new device helps reduce the risk as the two balloons sit more steadily in the stomach. Claire Cope became one of the first people in the UK to undergo the procedure in June 2012. She has since lost more than two stone. Back then, she was an overweight driving instructor with a BMI of 30 that rendered her clinically obese and left her with pain in her feet and ankles. Claire had the balloon inserted one morning and was home by late afternoon. Three days later she was back at work. Dieticians supervise the patient’s progress for 12 months, advising them on sensible eating and portion control. Claire says: ‘I continued to eat the same foods I have for the past 30 years but my portion sizes were dramatically different and by the second week my hunger had waned. Having lost 2st 4lb, Claire was understandably anxious that she might start over-eating again once the balloon was removed. Although she did gain 4lb, she has maintained her weight at 11st 7lb for the past 12 months. Up to 80 per cent of people regain some weight within a year of having an intra-gastric balloon removed.